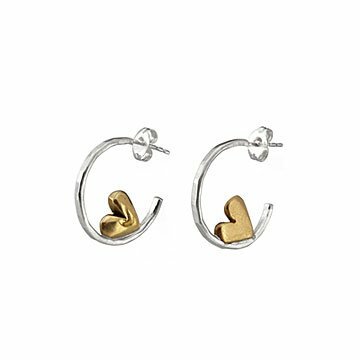 Sweet peek-a-boo bronze hearts are nestled into these hoop earrings by Canela Lemoine. These earrings aren't like traditional hoops. For a touch of sweetness, just turn your head slightly: then a peek-a-boo heart emerges. Canela Lemoine handcrafts them from sterling silver and bronze. She turns the heart of its side so that it snuggles into the round edge of the hoop. It's details like this that make us say, "awww," and we hope whoever you give this pair to will say the same. Handmade in California. Canela Lemoine left her job in pediatrics to care for her own family. She began to craft jewelry from her bedside table, a "workshop" she has since outgrown. Her pieces come from life's everyday joys, whether it's exploring California’s shores with her seven children, or celebrating a birthday with a home-cooked meal. She hopes her jewelry inspires you to celebrate and cherish the most meaningful moments in your life.